it's off to our last day of work we go! We've been waiting for this day since May the 1st! Ruth said yesterday that it sure will be nice to get a change of scenery. It hasn't been that bad really considering that it is a pretty spot, we've been able to be outdoors a lot of the time, and much of the last six weeks we've had near perfect weather. But almost five months in one spot is a pretty long time for us. A bit of a cloud hanging over the lake this morning. I just came up from taking a picture of the lake. Very strange, the fish were jumping out of the water almost so quickly that you could stand there and take a picture of them! So I did! Fish jumping in the mist. Our last two seasonal campers came and picked up their rigs yesterday. 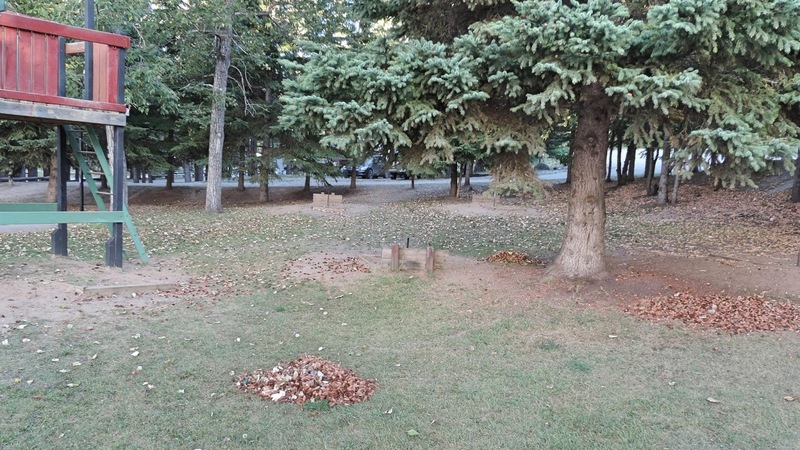 That part of the campground is now empty. We've only got two other campers in the whole park. Yesterday, we closed up the overflow camping area, put plumbing antifreeze in the toilets, and locked things up. Today we'll put the boats away, change the oil and drain the gas out of the equipment, do the final clean up of the washrooms and lock them up, and do some more raking. 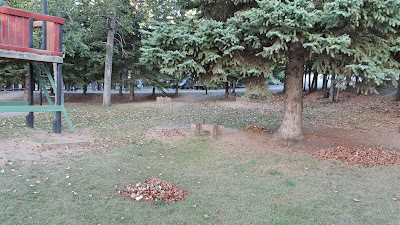 The leaves and pine cones are falling so what we rake up now will make for less to be raked up next spring, whether it's us that does it then or someone else. And then tomorrow, we'll get our cabin cleaned up and the car packed up. Tuesday morning we'll hit the road bright and early because it looks like it will be a long driving day. We had been trying to get a couchsurfer host in Yorkton, SK but no response yet. So we'll do a long drive that day, 800 kms (500 miles) to save ourselves one nights accommodation expense. Thanks Wendy! But that would add another 100 kms to our drive, plus we've never been through Yorkton before so we want to take that route. Good luck on the road, safe travels. If you are there next year we may just drop in. We are planning a trip to Edmonton and Winnipeg to see family with the RV. That would be nice Contessa, we would enjoy the company! You may want to try for May (not May long weekend though), June or the early part of September though, otherwise the campground is very busy. Likely early to mid June. Kinda depends on when Chris and Juan are here. Maybe we can get them to travel with us to see you. Just take lots of breaks. I did 900km one day with the motorhome, but took alot of breaks when I started to zone out. Rest up, long travel ahead! We intend to take our time and enjoy seeing some different scenery because for the last 4 1/2 months we have seen the same scenery day in and day out. Good luck! I'm excited about your travels. Thank you Sft, we are excited too! Yep, that is still a little while to go. I can't wait until you tell us that it is your last day of work, you may be surprised at how fast that time will go! Great job - way to finish strong! Very interesting reading about your time there this past summer. Safe travels and hope the couch surfing works out. Thank you Randy and Pam. We are looking forward to the next 7 months, it should be pretty interesting as well!